Different studies are showing that yoga exercise can help people suffering from asthma and even cut down asthma attacks in some. Yoga, used as an additional therapy in combination with doctor prescribed medication has wonderful benefits. It has long been known that yoga postures are renown for breathing. The pranayama (breathing exercises) expands lung capacity by increasing the airflow, air capacity, lung stamina, and lung efficiency. Certain postures like upper back bends open the chest area and are helpful during an asthma attack. This is particularly important if it is hard to exhale during an attack. Actually due to the restricted air passageways and collapsed alveoli, asthma sufferers actually have a harder time exhaling than inhaling. The central belief behind all yoga exercises is that the mind controls the body and with proper mind control, asthma symptoms and asthma attacks can be controlled. Yoga is an entire system of mind and body exercises called yogasanas, yogic kryas, pranayamas, relaxation and meditation, and these exercises are all designed to calm the system down and to help a person to relax in order to promote health and well being. These exercises go hand in hand with a proper diet, and life style. Yoga exercises also stimulate the digestion and circulatory system and they strengthen the lungs. Over time yoga can even cure asthma. Inverted postures will drain the excess mucous from the lungs and balance out the immune system. Generally speaking yoga also reduces stress, which is a prime concern for asthma sufferers. In many cases yoga has better results calming the body down and reducing tension better than drugs and external therapies Yoga helps the body to heal from the inside out and not the reverse. Yoga relaxes the mind and body. Yoga also reduces physical tension, and muscle tightness, and promotes physical health and well being by stimulating the parasympathetic nervous system. Yoga improves the body’s immune system, which in turn will raise the body’s ability to fight off infection. How pranayama can help asthma sufferers is that the practice of breathing is designed to control breathing. When the behavior of the breathing is controlled the asthma sufferer can cut down asthma attacks, which is essentially, the body’s breathing capacity going out of control. When the breathing is out of control the body is in a state of panic. Controlling the breathing can put asthma sufferer back into a normal state much quicker and reduce stress levels, which are partially the reason for the attacks. There are different kinds of breathing exercise for what triggers the asthma attack in the first place. 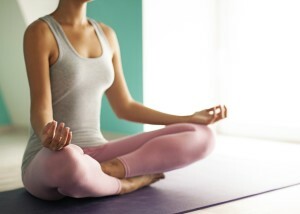 With the practice of yoga and self-awareness asthma sufferers will become in tune with their bodies and become able to identify their own asthma triggers and then avert the attacks by practicing the yoga exercises. Breathing exercises should be done in combination with pranayama (breathing exercises to complete the holistic approach to healing. These exercises are best practiced on an empty stomach; however, it is okay to sip water while doing the exercises. You need to wear light loose comfortable fitting clothing and practice your exercises outside or in a well-ventilated room. If while doing your exercises you feel any symptoms coming on, rest your head on your arms or a table or lay down until the symptoms subside. If you feel these particular symptoms: nauseous, shortness of breath, then get up and walk around, you may just be hyperventilating and need to work off the nervous energy but don’t resume your exercises for a day or two. The way you are breathing now as an asthmatic is a conditioned behavior and you can change that conditioning with the help of yoga to normalize your breathing and make you feel better in the long run.